Due to large variations in the worlds different currencies we have priced all our products in NOK (Norwegian Kroner). All prices are without taxes. Customers with Norwegian shipping addresses will have VAT/ MVA (Tax) automatically added to the prices when they complete their orders or when logging in. VAT/ MVA will be added when order shipping country address is Norway. Rosita Net-Shop currencies - $USD, €EUR and £GBP - are updated daily and may be used. If you make the choice to use other currencies than NOK, be then aware that the given prices (exchange rates) is what you will have to pay through checkout of your order. To cover our costs, the prices in $USD, €EUR and £GBP are higher than when using our preset currency NOK (Norwegian Kroner). Please use the currency selector above. 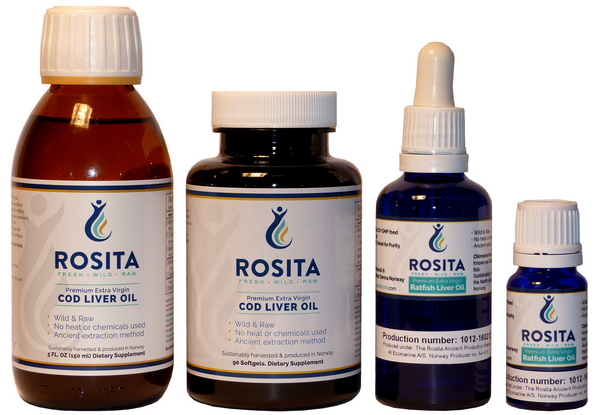 There are no discounts for Rosita Extra-Virgin Cod Liver Oil™. For Company Customers (Wholesale) and practitioners we may consider special discounts after registration. Please email us for further assistance and approval. To determine approximate cost in your own currency use the currency calculator above: type (or copy & paste) 1000 into the left hand box of the currency calculator and then select your desired currency in the right hand ("into") box using the drop down menu, and click the "Convert" button. Free shipping with tracking number on total amounts greater than NOK 4100. (Not wholesale). Packages with total price less than NOK 4100 are shipped according to the methods selected during "Check out". Orders will be shipped out from us here in Northern Norway within four days of receiving the completed order, and an email confirming that the product has been "Shipped" will also be sent to you. * Be aware of delays due to your national customs services. Some few countries have customs services that may use longer time to process their services to you the customer. (Please check this out with your local customs authorities before ordering). 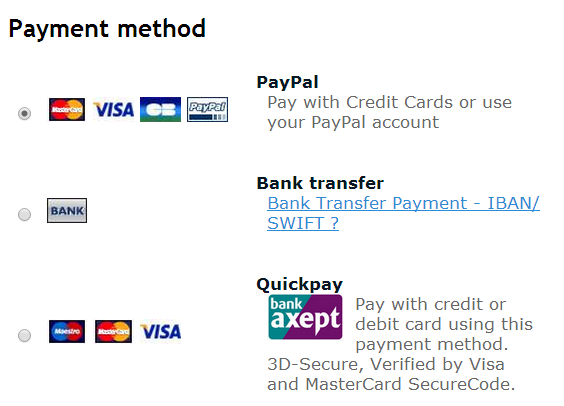 Our Net-Shop uses Paypal, Bank Transfer and Quickpay as payment methods. PayPal is our preselected payment method. Using PayPal you will automatically receive your payment confirmation within minutes after completing an order. QuickPay is a payment method using 3D-Secure. Here you may use your credit or debit card with “Verified by Visa” or “MasterCard SecureCode”. QuickPay communicates directly with your bank or card provider through Nets/ Teller and verifies the payment balance on your card's attached account using 3D-Secure. Using QuickPay you will automatically receive your payment confirmation email within minutes after completing an order.